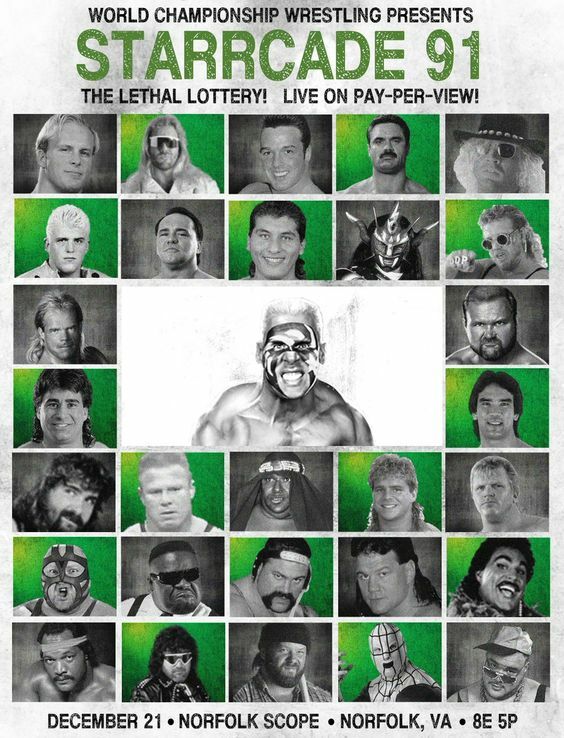 Starrcade (1991): Battlebowl – The Lethal Lottery was the ninth annual Starrcade professional wrestling pay-per-view (PPV) event. It took place on December 29, 1991 from the Norfolk Scope in Norfolk, Virginia. The event consisted of the Battlebowl battle royal and its “Lethal Lottery” tag team qualifying matches. 40 wrestlers, paired in randomly chosen tag teams, competed in qualifying matches; the winning team advanced to the 20-man Battlebowl Battle Royal to determine the winner. This was the first Starrcade under the WCW (instead of the NWA) banner and the first to not include Ric Flair, who had left for the World Wrestling Federation).Sting won Battlebowl, and his victory led to a feud with Lex Luger over the WCW World Heavyweight Championship.